Boca Raton residents can count on Lindstrom Air Conditioning & Plumbing for all of their plumbing service, repair and equipment needs. 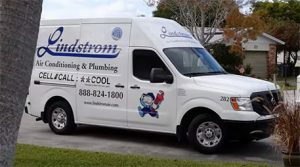 Lindstrom Air Conditioning & Plumbing proudly serves Boca Raton, Florida with professional plumbing service you can count on 24 hours a day, 7 days a week. We are staffed with experienced, friendly, licensed plumbers that are ready to help with all of your plumbing service and installation needs. Our plumbers will arrive on-time in a clean uniform and clean up when the job is finished. You will receive quality plumbing workmanship at a fair price – one that you approve before our plumbers start their work. From fixing small leaks to water heater installation and sewer line repair, Lindstrom’s expert plumbers are ready to help. Having hot water issues in your home? Looking for a new water heater or just need a flush & fill? Whatever your water heater needs are, we can help! We have serviced, repaired and installed water heaters in Boca Raton homes for years and our plumbers have the training and experience to help ensure your water heater issues are resolved properly, the first time. In addition to standard storage water heaters, we offer Rheem and GE Geospring Hybrid water heaters. If you are in the market for a new water heater and need help, our plumbers can help you select the best water heater for your Boca Raton home. Whether your kitchen sink is backed up or your bath tub has a slow drain – call Lindstrom! Our plumbers are equipped with the tools to locate and resolve your drain issues. We also offer video inspection of your main sewer lines to help locate problem areas. If we find any problems in your main lines, we’re a full service plumbing contractor that is able to help repair and replace your sewer lines. Learn more about our drain clearing services. The piping in your Boca Raton home is the foundation of your plumbing system. Over time, these pipes can rust and corrode, leading to water leaks. This can be a very slow process. So, homeowners typically don’t even know that they have an issue until these leaks begin causing further damage. Re-piping is often the best solution when this has occurred. It’s also something to consider if you experience leaks and want to stem the issue before you have a more expensive problem on your hands. Our plumbers will work with you to determine how much re-piping your home needs. Whether you need an entire house re-pipe or one loop, we can help put an end to damaging leaks and ensure that your home has clean, healthy water. Learn more about re-piping. Water pollution and water-borne contaminants are climbing to their highest levels since the 1970s. The importance of clean, safe drinking water is greater than ever. Families in Boca Raton and everywhere are looking for not only better tasting water, but also for cleaner water that will ensure their family’s safety and good health. Learn about the benefits of an Everpure Water Filtration System installed in your Boca Raton home. We have been serving Boca Raton and South Florida residents since 1975 and have become one of Florida’s most trusted plumbing companies. We work hard to make sure you’re happy. That’s why we stand behind our plumbing service with a 100% satisfaction guarantee. Give us a call when you need a plumber in Boca Raton, or schedule service online now!